Given a square where the side lengths are 3cm. Find the perimeter of this square. 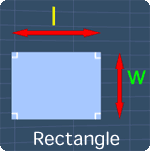 Given a rectangle with the length of 5ft and the width of 3ft. Find its perimeter. Given a triangle with the side lengths of 3cm, 4cm and 5cm. Find the perimeter of the triangle. Given a parallelogram with the side lengths of 8 inches and 6 inches. Find the perimeter of this parallelogram.